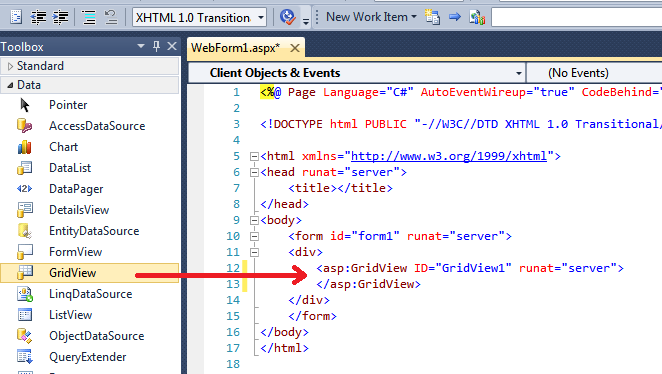 This post shows a simple example of using GridView control in ASP.NET. Step-by-step procedures show how to display data table in GridView control. If there are more than 20 rows, so-called paging will be enabled and page number will be shown at the bottom. 1. In ASP.NET web project, add a new Web Form. Let's say we have WebForm1.aspx. 3. Once we have GridView control in .aspx, we can add data to the control in code behind. Let's assume the MyData.GetDataSet() returns DataSet containing Emp table data (see below for this part). To bind table data, (1) set DataSource to the dataset and (2) call DataBind() method of GridView control. So the steps above are enough to display all table data to GridView control. However, if the table has many rows, limiting rows per page - so called Paging - might be useful. 4. Set [AllowPaging] to true and change [PageSize] to 20 from default 10. (You can change these values from Property Window). This means you display max 20 rows in one page and if there are more pages, page number will be given at the bottom. 5. Add event handler for [OnPageIndexChanging] event. In the event handler, the code set PageIndex property and rebind the data. 6. Optionally, to make it look better, add [AlternatingRowStyle-BackColor] and CellPadding. Alternating setting enables different background for every other row. CellPadding gives some spaces in each cell. Below is the data access class, just added here to complete the sample code.